Maybe you’ve heard the story about the Rocks in a Jar lecture that has made its way around the internet. If not, you can read it here. 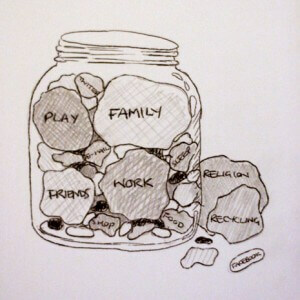 To summarize, the rocks in a jar concept represents time management and your life. The jar is the amount of time you’re given. We all fill the jar with big rocks, medium rocks, small rocks, and sand. 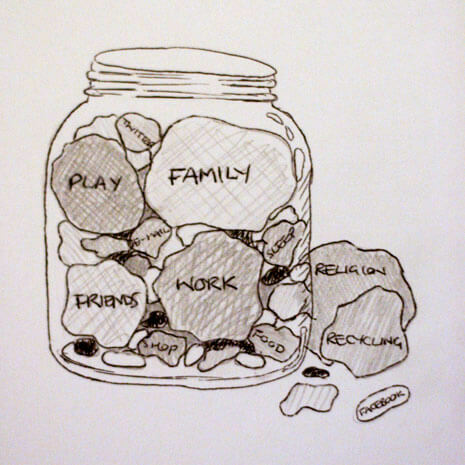 To fit the most into the jar, you need to prioritize the “big rocks” and then fill the gaps with everything else. It’s a simple metaphor that can be applied to fitness & fat loss very easily. With fat loss, people often prioritize the wrong things. A common example of this is doing slow & steady cardio 5 days a week while neglecting nutrition & strength training. While cardio is beneficial, it’s inferior to both nutrition & strength training for creating permanent results. Prioritize the most important and most effective actions & habits in order to optimize fat loss. Strength training is second because it transforms your metabolism for the longterm. Conditioning & Interval Training is third. It burns more calories than slow, steady cardio by improving your metabolism over a period of 1-2 days. Long, slow runs (traditional cardio) and easier activities are last. They’re effective but the benefit stops as soon as you stop doing cardio. The jar is your free time and ability to recover. Spend both wisely. Invest in activities with a large return on investment. Remember, the results from fitness come from recovery. Muscles repair, grow, and strengthen during the recovery window. This is also the EPOC (Excess post-exercise oxygen consumption) period. EPOC is what causes your body to burn 2-4x as many calories after exercise than at rest and is a function of the recovery process. Nutrition, nutrition, nutrition. Remember, you can have achieve fat loss without exercising. It’s not ideal, but it happens every day. The most grueling & well-designed exercise program will not shed a significant amount of fat from your body without proper nutrition. Keep it simple! Protein, lots of veggies, fruit, and “carbs” only after exercise. Nutrition is the foundation on which fat loss is built. Without it, everything else will fail. Strength training makes you better at everything else. The benefits of strength training for fat loss are many. Strength training improves lean muscle mass. This increases your resting metabolism, so that you are burning more calories at all times – even at rest. Strength training improves bone density and creates the fit & athletic look that people strive for. Metabolic conditioning becomes much more effective when you can lift heavier weights and perform more difficult exercises. Emphasize compound, multi-joint exercises. Squats, deadlifts, lunges, step ups, hip thrusts, pushups, presses, rows, pullups, loaded carries, kettlebell swings, and throws. These exercises utilize the greatest amount of muscle mass. As a result, they release fat burning hormones such as testosterone and growth hormone. Conditioning. Interval training, metabolic conditioning, circuit training, and boot camps. It all fits into the conditioning category. This is what most people think of as “fat loss” workouts. And they’re effective! But they are the most effective when added to a foundation built on nutrition and strength training. Remember: the stronger you are, the more effective your conditioning will be. Strong legs perform faster & more powerful squats in a circuit. Strong arms whip battling ropes at a greater RPM. Examples: HIIT, interval training, metabolic conditioning, circuits, density training, sled work, battling ropes, jump rope, sprints, running. These are the bonuses. This can be things that we like to do, like bicep curls, Yoga classes, and jogging. These are the things that most readily spring to mind when most people think of exercising. To be honest, they are the easy things. Arm workouts are easier than heavy squats or deadlifts. Jogging at an easy pace is more comfortable than intervals on an Airdyne bike. Easy things have their place, but they don’t compare to the difficult things. They are beneficial, make no mistake about it. But for ideal & rapid fat loss, they don’t compare to the bigger rocks. Examples: most isolation exercises, Yoga, pilates, walking, and jogging. Nutrition is the key. Always will be. Strength training has its own benefits and makes everything else more effective. Conditioning is superior to slow, steady-state cardio for fat loss. Leave the little things for when you have time. Isolation exercises go here. Easy jogs or walks goes here. Yoga and pilates goes here. If you liked this article, please share it on Facebook with your friends. If you have any questions, please ask them in the comments box below.